The Marriott Lincolnshire Resort, located about 1 hour north of downtown Chicago, lies on 170 wooded acres in the midst of the sophisticated North Shore District. This enchanting destination is perfect for a quick golf trip, for retreat-style meetings, weddings and special events, family vacations or for those who just want to get away and make the world disappear for awhile. 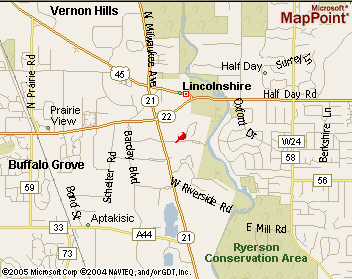 While conveniently located near highways that afford easy access to the dining, nightlife, shopping and attractions Chicago has to offer, the Marriott Lincolnshire can be a destination in itself, with practically everything one needs for a relaxing holiday in a self enclosed resort style community. The golf facilities at the Lincolnshire include Crane's Landing - a George Fazio designed 18-hole par 70 championship design that is both challenging and user friendly as a resort golf experience. 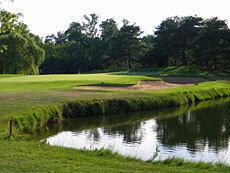 The course features bent grass fairways, tightly bunkered greens and scenic vistas of the Des Plaines River and surrounding woodlands. Four sets of tees allow golfers of all skill levels to choose from distances ranging from 3620 to 6290 yards, with a top slope rating of 125 for men and 135 for women. There is a pro shop and snack bar with sandwiches and beverages, and practice green is also on property. The clubhouse is a short walk from the resort accommodations For a pictorial review of Cranes Landing, click here. 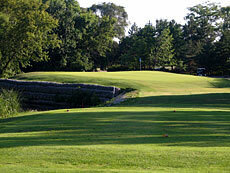 Many of North Chicago's top courses are just a short drive away. For an alphabetical listing of golf courses with information, web links and pictorial reviews, see the links section on the bottom of this page. The resort features 384 guest rooms - 6 of them suites. Each room is equipped with refrigerators, coffee makers, remote control cable/satellite TV with in-room movies, complimentary morning newspaper, 2-line phones with voice mail, and multi data ports and wireless services. For the business traveler, "The Room That Works" rooms are available - specifically designed to accommodate the business traveler. 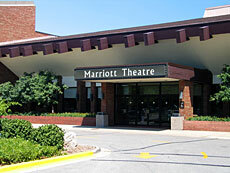 The resort is connected to the fabulous Marriott Theatre , with musicals such as "Footloose" and Oliver" performed seasonally, in a state of the art 887 person theatre complex. The Fairfield Inn Restaurant offers family friendly NorthShore fare for breakfast, lunch and dinner - with fabulous breakfast buffets. King's Warf serves seafood and savory steak dinners plus a champagne Sunday brunch. 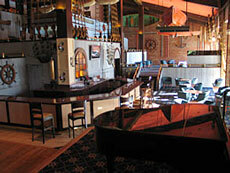 The Tack Room is just the right place for a drink or casual snack with friends. 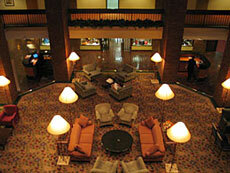 Over 34 rooms in over 40,000 square feet of flexible meeting and banquet space are available. The 10,800 square-foot elegant grand Ballroom, divisible into eight sections, can accommodate up to 1200 people for receptions or up to 800 for banquets. The 30,000 square foot Racquet center can accommodate up to 220 people in 8' by 10' exhibition booths. 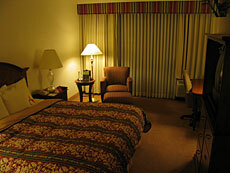 Concierge services and a full business center are also available. From O'Hare Airport (18 mile NE) take 294 north to half Day exit and turn left; go approximately 2 miles to Milwaukee Avenue, go 1/4 mile and turn left; turn left on Marriott Drive and follow signs.